Story: From the acclaimed director of "Mission: Impossible II," "Face/Off" and "The Killers," comes a dazzling, visionary epic based on the legendary Battle of Red Cliff, in which a force of fifty thousand defeated an army of nearly one million. In 208 A.D., in the final days of the Han Dynasty, shrewd Prime Minister Cao Cao convinced the fickle Emperor Han the only way to unite all of China was to declare war on the kingdoms of Xu in the west and East Wu in the south. Thus began a military campaign of unprecedented scale, led by the Prime Minister, himself. Left with no other hope for survival, the kingdoms of Xu and East Wu formed an unlikely alliance. Numerous battles of strength and wit ensued, both on land and on water, eventually culminating in the battle of Red Cliff. During the battle, two thousand ships were burned, and the course of Chinese history was changed forever. 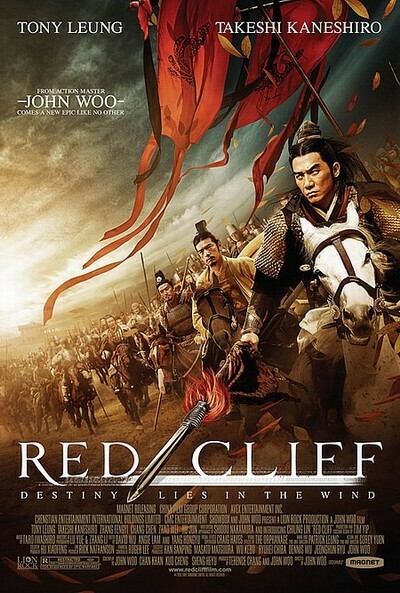 Note that this is the Western version of the two Chinese releases "Red Cliff" and "Red Cliff II". English subtitles.